Loviisa is a municipality and town of inhabitants on the southern coast of Finland. On the 25th (Sat), look for gifts at Riimikko, get some fabulous bargains at Brunberg Candy Factory Shop, then contemplate the long history of The Runeberg Home, and finally take in the architecture and atmosphere at Loviisan kirkko. To find ratings, photos, other places to visit, and other tourist information, read Loviisa planner . New York City, USA to Loviisa is an approximately 17.5-hour flight. You'll lose 7 hours traveling from New York City to Loviisa due to the time zone difference. Traveling from New York City in May, things will get a bit cooler in Loviisa: highs are around 60°F and lows about 42°F. Wrap up your sightseeing on the 25th (Sat) early enough to travel to Helsinki. Head to Market Square Kauppatori and Kamppi Shopping Centrefor plenty of shopping. Deepen your sense of the past at sights like Sea Fortress Suomenlinna and Uspenskin Cathedral (Uspenskin Katedraali). 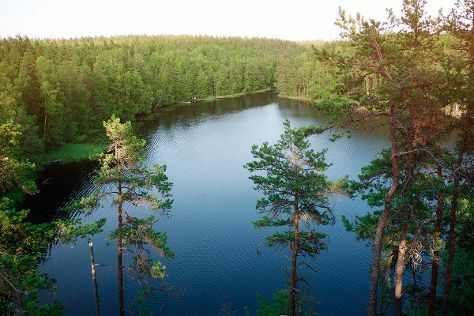 Explore Helsinki's surroundings by going to Sipoonkorven Kansallispuisto (in Vantaa), Espoo (Nuuksio National Park & Arctic Expedition) and Teijo national park (in Pernio). Next up on the itinerary: contemplate in the serene atmosphere at Rock Church, wander the streets of Katajanokka, gain insight with Jarvenpaan Taidemuseo, and look for gifts at Artisaani. For other places to visit, reviews, photos, and other tourist information, refer to the Helsinki itinerary builder site . Getting from Loviisa to Helsinki by car takes about 1.5 hours. In May, daytime highs in Helsinki are 60°F, while nighttime lows are 43°F. Finish your sightseeing early on the 4th (Tue) to allow enough time to travel back home.